Unless Jehovah builds the house, it is in vain that its builders work hard on it.—Ps. 127:1. Jehovah’s organization goes to tremendous lengths to provide and help finance modest Kingdom Halls. The work of designing, building, and remodeling them is handled by unpaid volunteers. Since November 1, 1999, more than 28,000 beautiful new centers of pure worship have been provided for congregations worldwide. That means that for 15 years, on average, five new Kingdom Halls have been provided every day of the year. Efforts are being made to support the construction of Kingdom Halls wherever they are needed. This loving provision is based on the Scriptural principle that the surplus of some might offset the deficiency of others, in order that “there may be an equalizing.” As a result, beautiful new centers of pure worship have been provided for congregations that would otherwise never have had the financial resources to build a Kingdom Hall for themselves. King Solomon is credited with writing this Psalm, which is called a Song of the Ascents, apparently being sung by the people as the ascended the mountain on which Jerusalem and the temple was built. Solomon, of course, was the builder of the magnificent temple. At the dedication of the temple Jehovah manifested his presence within by means of a dense cloud that drove the priests out. Thereafter a miraculous light shone above the golden ark of the Covenant called the Shekinah light, which represented Jehovah’s presence. It seems that God tolerated a bad situation for a long time, perhaps leading to their assumption that Jehovah had left the land. Contributing to their false sense of security the elders were no doubt aware that during the reign of king Hezekiah God had intervened to defend Jerusalem —completely decimating the Assyrian army by means of a warrior angel. That is likely why Jeremiah warned the people not to put their trust in the temple of Jehovah, as if it were some sort of lucky charm. The presence of the temple would not protect them. It was just a building, after all. As a result of their wickedness Jehovah brought ruin upon Solomon’s temple. The hard work of the tens of thousands of laborers Solomon had employed was brought to nothing. It was in vain that the guards of the city stood their posts. 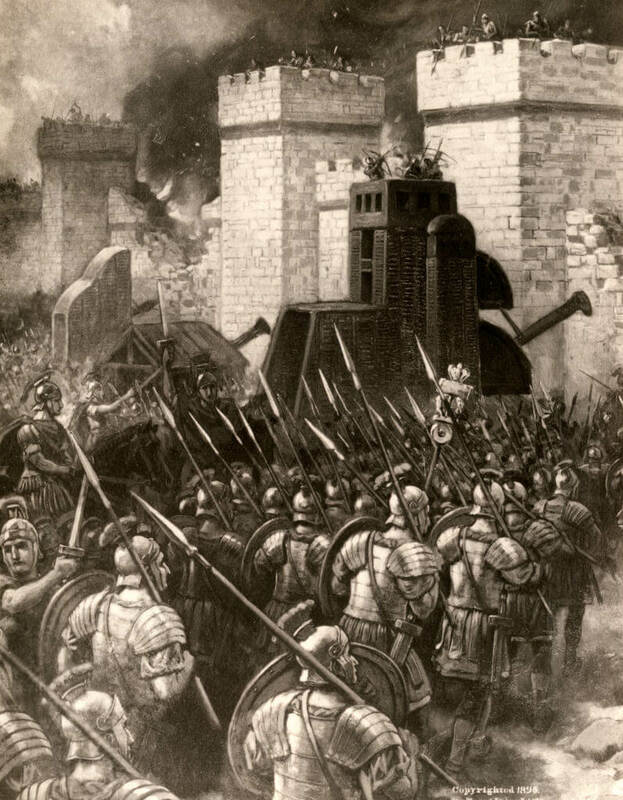 Jehovah brought the Chaldean hordes from far away and they burned Jerusalem to the ground. The city where Jehovah had placed his name was no more. A similar situation exists today. The leading elders of the Watchtower Society who boast of presiding over “pure worship” imagine that Jehovah does not see their works. They have no expectation of any sort of settling of accounts. They imagine Christ has already come, that he has cleansed them and given them his unqualified approval. Besides the thousands of modest kingdom halls the Watchtower has constructed, the Society’s business-minded board of directors apparently realized they were sitting on a gold mine in Brooklyn and decided to cash in on the inflated real estate values. Putting all of their properties up for sale, properties previously, solemnly dedicated to Jehovah, and exploiting the same small army of volunteers that had been trained to build kingdom halls, a spacious new headquarters facility was built outside of New York City. Far away from the grime and crime of the big city the Governing Body have reported that they are happy and refreshed residing in the peaceful surroundings afforded by their lakefront condominiums. Like the Jews living in Jerusalem prior to Babylon’s invasion, the governing elders of Jehovah’s Witnesses have no expectation of being on the receiving end of any sort of divine judgment. They are the keepers of pure worship. Their “prophets” have neutralized all of the Scriptures, interpreting them to glorify the organization as the embodiment of the very Kingdom of God. However they are in for a rude awakening. The prophecy of Daniel similarly foretells that during the time of the end the sanctuary and constant feature will be trampled upon and the holy ones brought to ruin. The Watchtower’s “prophets” have adjusted this to the past. Supposedly the Anglo-American kings brought the holy ones to ruin back during World War Two by conscripting young men into the military. The book of Revelation also portrays the holy city and temple courtyard being trampled upon by the nations, which, amazingly took place during the First World War —at least according to the Watchtower. How? Apparently the US government censored a few paragraphs of the Finished Mystery book, a publication that is so riddled with nonsense that the Watchtower wishes it had never published it in the first place. At some point in the future this present system is going to come crashing down. And, no, I am not referring to the end of the world at Armageddon. I am referring to what is symbolized in Revelation as the opening of the seven seals —specifically the opening of the 6th seal. To paper over the fact that Jesus clearly indicated that the symbolic heavenly luminaries go into eclipse after the tribulation, the Watchtower’s institutional prophets claim that the First World War was merely the preliminary shakings of the great upheaval that is still in the future. So, even after a century since the time the sixth seal is believed to have been opened the events associated with its opening still have not occurred! Unless a person choses to be willfully blind, it should be clearly evident that none of the seals of the symbolic scroll have been opened. War, famine, pestilence, earthquakes — it is all in the immediate days ahead. The judgment contained in James is associated with the presence of Christ. That is why in the very next verse James exhorted: “Be patient then, brothers, until the presence of the Lord. Look! The farmer keeps waiting for the precious fruit of the earth, exercising patience over it until the early rain and the late rain arrive. You too exercise patience; make your hearts firm, because the presence of the Lord has drawn close.” Since the rich men have not howled and wallowed in misery, a judgment reserved for the last days, neither has the presence of Christ begun. However, there is ample reason to believe that it has drawn close.